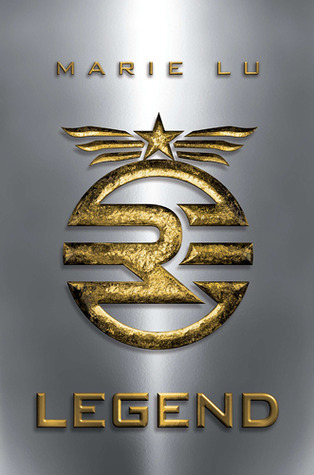 Legend is set in futuristic Los Angeles, now a Republic at war with its neighbors. Did I enjoy this book? I was captivated from the beginning, and the opening sentence is one of the best I’ve ever read: My mother thinks I’m dead. And the second sentence makes you even want to read more: Obviously I’m not dead, but it’s safer for her to think so. Why is it safer for her to think so? You have to read this amazing book to find out for yourself. Legend is action-packed, has lots of suspense, the plot is fast-paced, the writing is good, and it has a little touch of romance. Well, I was happy I wasn’t reading another Romance novel categorized as YA. The book is written from the point of view of two characters: Day, the most wanted criminal in The Republic; June, prodigy of The Republic, only citizen with perfect scores (1500) in the Trials. Even though I thought the world building lacked in some aspects, I still loved the book, still had mental pictures of the settings in my head. I loved being taken to the streets of the Lake sector, a place I can as well call ‘The Ghetto’. The street life kept reminding me of Dickens’ Oliver Twist and James Colliers’ Chipper, except that characters in this one were older. I loved the POV switch between June and Day. It lets you know what’s going on in their heads. If the book were written from the POV of Day only, I think I’d hate June. I didn’t have any problem with recognizing each character, although Day’s narrative was printed in bold letters. Day’s voice is that of a tough, bad-boy, street-hardened guy, while June’s is softer, contemplative, and strong-willed. Both characters are resilient, but if I have to choose who I liked best, then I guess it’s Day. I admire his sacrificial spirit, always been there to help his family. And that’s another thing I loved about this book – the close family ties. I cared so much about it. Legend has other lovable characters. There’s Tess, Day’s sidekick. She’s younger, vulnerable, and near-sighted. But she’s strong. She knows how well to fix an injury with bandages. I cared for her just like I cared for the main characters. Then there’s Kaide, another tough girl, who gets into skiz fights. And I liked John, Day’s older brother, who supports and is very protective of his family. If there’s something I didn’t like about Legend, then it’s the world-building. I wish I had more mental images in my head like I do when reading other good YA Dystopia books. I also thought the word-count was too low, compared to other YA Dystopia novels. I can’t wait to read Prodigy. But I hope it’s more enjoyable than Legend. That being said, I present my five Stars (*****) to Legend, and I commend Marie Lu for this wonderful debut. I’m also looking forward to the movie. Yeah, I think it’s typical of good YA Dystopian books. I have thought about reading this book a dozen times and your review sealed the deal. I love multiple POV's, though I like more romance. I'm going to add to my shelf. Thanks Kaykay! I'm glad that my review sealed the deal for you. :) Yeah, the multiple POVs was good. I enjoyed it. I like romance in a book, but most times I want it not to overshadow the main story. Thanks, Gabi. I'm glad you loved it. Oooh this is an excellent review! I have to review Prodigy so I need to read Legend first, it's great to hear it's such a good book. Thanks! :) Yeah, it's a great book, and I'm happy you loved the review. Looking forward to reading your thoughts on Legend when you're done with reading. Ahh, yet again another fantastic review and I still need to get a hold of this book and read it!! Thanks for sharing! You're definitely going to like this one, Florentine. :) Thanks for stopping by! Awesome review! I liked Tess too but I was kind of like "Okay you're cute, go away now, June and Day please!" But I really liked how Marie Lu was able to make even the smaller characters seem important. Haha! I agree with you - Marie lu makes the secondary characters rounded and important.